Abdominoplasty, or more commonly known as tummy tuck, is the medical term used to describe the plastic surgical procedure to reduce excess skin and fat from the abdomen. This procedure most often incorporates tightening of the abdominal muscles as well. A mini abdominoplasty usually does not require tightening of the muscles and can be accomplished with a shorter surgical incision. The incisions for either the full or mini abdominoplasty are placed low on the abdomen usually in the same place a caesarian section incision is placed. When a full abdominoplasty is required, an additional incision is required around the umbilicus. Who are the best candidates for abdominoplasty? 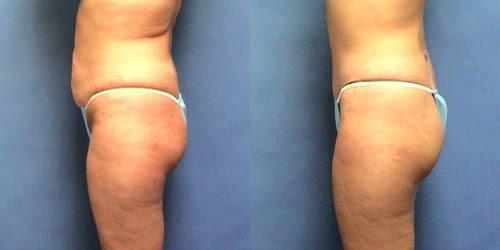 The ideal candidate for abdominoplasty is a patient in good health and ideal weight. Abdominoplasty is not a weight loss surgery. 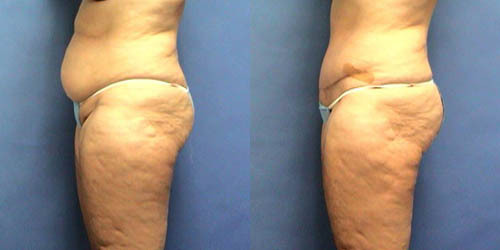 Rather it is ideal for those patients whom have already lost significant weight and are left with excess skin in the abdominal area. Women whom have excess skin after pregnancy are also candidates, but are advised to not have a tummy tuck procedure until they are certain they do not plan to have any more children. What is a tummy tuck consultation? During your initial consultation with Dr. Paul Howard for abdominoplasty, Dr. Howard will speak to you personally about your decision to have plastic surgery to address your cosmetic concerns. Dr. Howard will inquire about your expectations, and he will give you his professional opinion to address those expectations. Your consultation will include a detailed medical history, photos will be taken, and you will meet with Dr. Howard’s nurse and patient coordinators to help develop a surgical plan that best fits your schedule. Additional information will be provided to you regarding planning for plastic surgery and recovery. Dr. Paul Howard performs all of his tummy tuck surgical procedures in a fully accredited surgical facility. These procedures take about 2 hours, and the patient will be kept for observation for approximately one hour afterwards. Patients are allowed to go home following surgery. Patients will have a surgical garment (like a girdle) and dressing placed on them in the operating room. Most patients can also expect to have drains surgically placed as part of the surgical procedure. These drins are not as intimidating as they may seem and help keep the swelling down during the first few days of recovery. Patients should not remove this garment and dressing until instructed by Dr. Howard. Most patients will have their first post-operative visit with Dr. Howard 2 or 3 days after surgery at which time Dr. Howard will remove the drains, change the dressing, and place the garment back on. What is tummy tuck recovery & downtime? Patients must arrange for someone to drive them to and from the surgical center the day of surgery. Either a friend, family member, or a nurse must remain with you the first night after surgery because you will have been sedated. You will always want someone to drive you to your first post-operative visit approximately 3 or 5 days after surgery. Your recovery after surgery will include mild to moderate pain and discomfort. This will be easily controlled with the prescriptions given to you by Dr. Howard. Most patients find sleeping in a recliner or elevated using a few pillows allows them to more easily get in and out of bed and reduces swelling of the surgical area. Dr. Howard recommends the patient expect to be off work for 10 days to two weeks following surgery and refrain from physical activity for almost 2 weeks following surgery. Patients with small children should get a friend or relative to assist with childcare, due to the inability to lift or carry them. Dr. Howard does allow his patients to walk on a tread-mill one week following surgery. Patients should avoid sun exposure to the surgical incision for six months following surgery. Patients should drink plenty of fluids following surgery and maintain a healthy, low sodium diet. A surgical garment will be placed on you in the operating room. This garment must stay on until Dr. Howard instructs otherwise. You will not be allowed to shower until after the drains are removed 3 to 7 days after surgery. At which time, Dr. Howard will allow you to shower only, no sitting or soaking the incision in a bath tub. The surgical garment must be worn at all times for up to two weeks following surgery in order to keep down the swelling. Failure to wear this garment can cause increased swelling, thus increasing pain and significantly reducing your timely recovery. Abdominoplasty is a surgical procedure that involves a general anesthetic. Although complications are infrequent, all surgeries have some degree of risk. All of us at Paul S. Howard, MD will use our expertise and knowledge to avoid complications in so far as we are able. If a complication does occur, we will use those same skills in an attempt to solve the problem quickly. The importance of have a highly qualified medical team and the use of a certified facility cannot be overestimated. Hematoma – Small collections of blood under the skin are usually allowed to absorb spontaneously. Larger hematomas may require aspiration, drainage, or even surgical removal to achieve the best result. Seroma – Rarely, tissue fluids collect under the abdominal skin flap (usually after the drains have been removed). If this occurs, aspiration of the fluid, with a small needle, two or three times a week usually solves the problem. Few patients require further surgery. Loss of Sensation - Patients commonly experience areas of partial and/or complete numbness of the abdominal skin. Few experience permanent loss of feeling, but it may take several months or longer for sensation to return. Rarely, areas of numbness persist. Inflammation and Infection – A superficial infection may require antibiotic ointment. Deeper infections are treated with antibiotics. Development of an abscess usually requires drainage. 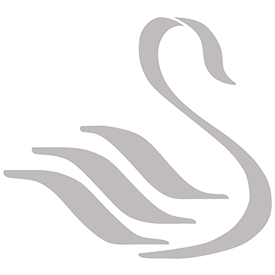 Patients are given a prescription to help prevent infection following surgery, and are asked to keep their hands clean or use gloves when changing the surgical dressing. Delayed Healing – Any incision, during the healing phase, may separate or heal unusually slow for a number of reasons. These include inflammation, infection, wound tension, decreased circulation, smoking, or excess external pressure. If delayed healing occurs, the final outcome is usually not significantly affected, but secondary revision of the scar may be indicated. Increased Risk for Smokers – Smokers have a greater chance of skin loss, infection, and poor healing because of decreased capillary circulation in the skin. Patients are asked to stop smoking two weeks prior to surgery, and to also avoid second-hand tobacco exposure. Thick, Wide, or Depressed Scars – Abnormal scars may occur even though we have used the most modern plastic surgery techniques. Injection of steroids into the scars, placement of silicone sheeting onto the scars, or further surgery to correct the scars is occasionally necessary. Some areas on the body scar more than others, and some people scar more than others do. Your own history of scarring should give you some indication of what you can expect. Patients are strongly advised to avoid ANY SUN EXPOSURE to the incision for SIX MONTHS. Failure to follow this order will result in permanent darkening of the scar, will cause the incision to heal thick and/or wide. Sensitivity or allergy to dressings or tape – Occasionally, allergic or sensitivity reactions may occur from soaps, ointments, tape or sutures used during or after surgery. Such problems are unusual and are usually mild and easily treated. In extremely rare circumstances, allergic reactions can be severe and require aggressive treatment or even hospitalization. Rarer Complications – Medical complications such as pulmonary embolism, severe allergic reactions to medications, cardiac arrhythmias, heart attack, and hyperthermia are rare but serious and life-threatening problems. Failure to disclose all pertinent medical data before surgery may cause serious problems for you and for the medical team during surgery. Tummy tuck is considered to be a cosmetic procedure and is not covered by insurance. 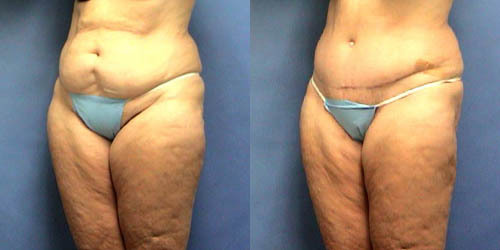 The cost for this procedure can vary on whether the patient requires a mini or full abdominoplasty. Dr. Howard's staff can better assist you with the exact cost during your consultation once Dr. Howard has had the chance to discuss with you your expectations and a surgical plan is recommended. Tummy cost begins at $3000.00 plus facility fee. There is a surgical procedure which is a MINOR variation of abdominoplasty called a panniculectomy. This procedure merely removes a portion of excess skin and is not cosmetic in nature allowing the incision to be placed more visibly (higher) on the abdomen. 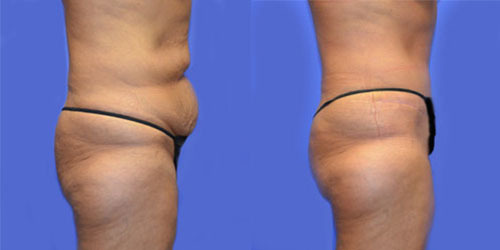 This procedure does not include the repositioning of the belly button and the tightening of the muscles. Some insurance companies approve this procedure for patients whom exhibit severe excess skin after weight loss surgery, but only for the skin excision and not the repositioning of the belly button. Almost all patients have expectations that are far greater than what a panniculectomy can acheive, thus requiring the cosmetic tummy tuck procedure. Some patients may have called their insurance company to inquire about coverage for a "tummy tuck." Many insurance companies often claim they cover "tummy tuck," but they are referring to the panniculectomy CPT code: 15830. This code only covers skin excision when the condition meets very particular criteria. The CPT code for a full tummy tuck is 15847. Blue Cross will NOT cover panniculectomy IF the patient is ALSO paying for the full tummy tuck (CPT code 15847) as stated in their coverage requirements. Blue Cross will not cover a portion of the surgical cost for the full tummy tuck if you were approved for the panniculectomy. This policy is specifically stated in their pre-determination coverage requirements. This policy is not determined by your plastic surgeon. Is my surgeon qualified to perform tummy tuck? It is important to find a qualified and experienced plastic surgeon when considering cosmetic surgery. Dr. Paul Howard is a real board certified plastic surgeon.There are many physicians performing this procedure, but are not board certified by the American Board of Plastic Surgeons. Many of the physicians claim to be "board certified," but have a different board certification from a completely different specialty. In other words, they are not real board certified plastic surgeons. To learn more, and to help you identify the difference, read the section about board certification on Dr. Howard's bio page. While Tummy Tucks can reduce your waist line, it is recommended you lose all the weight you plan to lose before you have a tummy tuck. Since the tummy tuck procedure surgically removes excess skin, losing weight before having this surgical procedure is recommended. Most insurance policies will not cover the removal of excess skin due to high volume weight loss or as a result of pregnancy. Some policies will cover a more minor surgical procedure called a panniculectomy. This procedure only removes excess skin not allowing for the full benefits of a tummy tuck procedure.Tummy Tucks are considered cosmetic and therefore not covered by health insurance. Neither of these procedures are for weight loss and they are both very different. 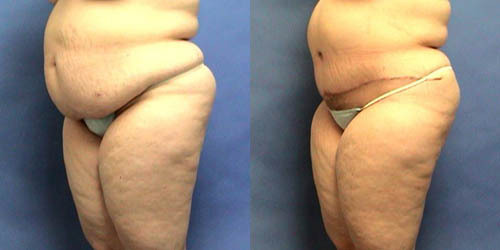 Liposuction only removes unwanted fat cells from beneath the skin. Tummy Tuck usually also involves some liposuction too, but it is primarily to remove excess skin that will not shrink due to having been damaged due to a variety of reasons. Tummy Tucks often also address muscle laxity issues that may have been damaged due to pregnancy. Excess skin can often be misunderstood as excess fat when in fact the skin is too damaged to shrink back to a more asethetically pleasing appearance. Plastic surgery procedures are becoming more and more popular with both men and women. Due to sagging skin after weight loss, more and more men are considering plastic surgery to address their aesthetic concerns. Nearly 30% of Dr. Howard's tummy tuck patients are men.